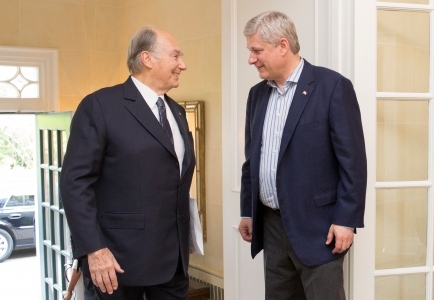 Prime Minister Stephen Harper will participate in a tête-à-tête meeting with His Highness the Aga Khan | Ismaili.NET - Heritage F.I.E.L.D. Media should arrive no later than 5:00 p.m.
Prime Minister Stephen Harper today held a productive meeting with His Highness the Aga Khan, who was visiting Ottawa in his capacity as Imam (spiritual leader) of the Ismaili community. During the meeting, Prime Minister Harper once again expressed his deepest condolences to the Aga Khan for the cowardly terrorist attack that took place earlier this month in Pakistan targeting Ismaili Muslims. The two leaders discussed the threat posed by violent extremists and their persecution and murder of religious and ethnic minorities. They also spoke about efforts to increase support for international development around the world, including improving maternal, newborn and child health.